Tatanka Iyotake, Sitting Bull (1831 – December 15, 1890), Hunkpapa Lakota. It is not easy to characterize Sitting Bull, of all Sioux chiefs most generally known to the American people. There are few to whom his name is not familiar, and still fewer who have learned to connect it with anything more than the conventional notion of a bloodthirsty savage. The man was an enigma at best. He was not impulsive, nor was he phlegmatic. He was most serious when he seemed to be jocose. He was gifted with the power of sarcasm, and few have used it more artfully than he. 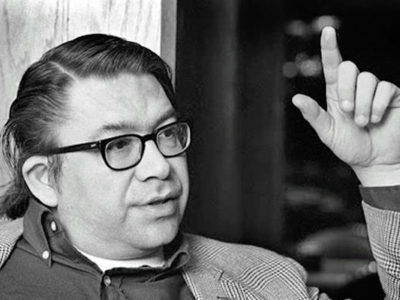 His father was one of the best-known members of the Unkpapa band of Sioux. The manner of this man’s death was characteristic. One day, when the Unkpapas were attacked by a large war party of Crows, he fell upon the enemy’s war leader with his knife. In a hand-to-hand combat of this sort, we count the victor as entitled to a war bonnet of trailing plumes. It means certain death to one or both. In this case, both men dealt a mortal stroke, and Jumping Buffalo, the father of Sitting Bull, fell from his saddle and died in a few minutes. The other died later from the effects of the wound. Sitting Bull’s boyhood must have been a happy one. It was long after the day of the dog-travaux, and his father owned many ponies of variegated colors. It was said of him in a joking way that his legs were bowed like the ribs of the ponies that he rode constantly from childhood. He had also a common nickname that was much to the point. It was “Hunkeshnee”, which means “Slow”, referring to his inability to run fast, or more probably to the fact that he seldom appeared on foot. In their boyish games he was wont to take the part of the “old man”, but this does not mean that he was not active and brave. It is told that after a buffalo hunt the boys were enjoying a mimic hunt with the calves that had been left behind. A large calf turned viciously on Sitting Bull, whose pony had thrown him, but the alert youth got hold of both ears and struggled until the calf was pushed back into a buffalo wallow in a sitting posture. The boys shouted: “He has subdued the buffalo calf! He made it sit down!” And from this incident was derived his familiar name of Sitting Bull. It is a mistake to suppose that Sitting Bull, or any other Indian warrior, was of a murderous disposition. It is true that savage warfare had grown more and more harsh and cruel since the coming of white traders among them, bringing guns, knives, and whisky. Yet it was still regarded largely as a sort of game, undertaken in order to develop the manly qualities of their youth. It was the degree of risk which brought honor, rather than the number slain, and a brave must mourn thirty days, with blackened face and loosened hair, for the enemy whose life he had taken. While the spoils of war were allowed, this did not extend to territorial aggrandizement, nor was there any wish to overthrow another nation and enslave its people. It was a point of honor in the old days to treat a captive with kindness. The common impression that the Indian is naturally cruel and revengeful is entirely opposed to his philosophy and training. The revengeful tendency of the Indian was aroused by the white man. It is not the natural Indian who is mean and tricky; not Massasoit but King Philip; not Attackullakulla but Weatherford; not Wabashaw but Little Crow; not Jumping Buffalo but Sitting Bull! These men lifted their hands against the white man, while their fathers held theirs out to him with gifts. Remember that there were councils which gave their decisions in accordance with the highest ideal of human justice before there were any cities on this continent; before there were bridges to span the Mississippi; before this network of railroads was dreamed of! There were primitive communities upon the very spot where Chicago or New York City now stands, where men were as children, innocent of all the crimes now committed there daily and nightly. True morality is more easily maintained in connection with the simple life. You must accept the truth that you demoralize any race whom you have subjugated. From this point of view we shall consider Sitting Bull’s career. We say he is an untutored man: that is true so far as learning of a literary type is concerned; but he was not an untutored man when you view him from the standpoint of his nation. To be sure, he did not learn his lessons from books. This is second-hand information at best. All that he learned he verified for himself and put into daily practice. In personal appearance he was rather commonplace and made no immediate impression, but as he talked he seemed to take hold of his hearers more and more. He was bull-headed; quick to grasp a situation, and not readily induced to change his mind. He was not suspicious until he was forced to be so. All his meaner traits were inevitably developed by the events of his later career. Sitting Bull’s history has been written many times by newspaper men and army officers, but I find no account of him which is entirely correct. I met him personally in 1884, and since his death I have gone thoroughly into the details of his life with his relatives and contemporaries. It has often been said that he was a physical coward and not a warrior. Judge of this for yourselves from the deed which first gave him fame in his own tribe, when he was about twenty-eight years old. In an attack upon a band of Crow Indians, one of the enemy took his stand, after the rest had fled, in a deep ditch from which it seemed impossible to dislodge him. The situation had already cost the lives of several warriors, but they could not let him go to repeat such a boast over the Sioux! “Follow me!” said Sitting Bull, and charged. He raced his horse to the brim of the ditch and struck at the enemy with his coup-staff, thus compelling him to expose himself to the fire of the others while shooting his assailant. But the Crow merely poked his empty gun into his face and dodged back under cover. Then Sitting Bull stopped; he saw that no one had followed him, and he also perceived that the enemy had no more ammunition left. He rode deliberately up to the barrier and threw his loaded gun over it; then he went back to his party and told them what he thought of them. Again he led the charge, and this time they all followed him. Sitting Bull was severely wounded by his own gun in the hands of the enemy, who was killed by those that came after him. This is a record that so far as I know was never made by any other warrior. He had a nephew, now living, who resembles him strongly, and who also represented him personally upon the field; and so far as there is any remnant left of his immediate band, they look upon this man One Bull as their chief. When Sitting Bull was a boy, there was no thought of trouble with the whites. He was acquainted with many of the early traders, Picotte, Choteau, Primeau, Larpenteur, and others, and liked them, as did most of his people in those days. All the early records show this friendly attitude of the Sioux, and the great fur companies for a century and a half depended upon them for the bulk of their trade. It was not until the middle of the last century that they woke up all of a sudden to the danger threatening their very existence. Yet at that time many of the old chiefs had been already depraved by the whisky and other vices of the whites, and in the vicinity of the forts and trading posts at Sioux City, Saint Paul, and Cheyenne, there was general demoralization. The drunkards and hangers-on were ready to sell almost anything they had for the favor of the trader. The better and stronger element held aloof. They would not have anything of the white man except his hatchet, gun, and knife. They utterly refused to cede their lands; and as for the rest, they were willing to let him alone as long as he did not interfere with their life and customs, which was not long. It was not, however, the Unkpapa band of Sioux, Sitting Bull’s band, which first took up arms against the whites; and this was not because they had come less in contact with them, for they dwelt on the Missouri River, the natural highway of trade. As early as 1854, the Ogallalas and Brules had trouble with the soldiers near Fort Laramie; and again in 1857 Inkpaduta massacred several families of settlers at Spirit Lake, Iowa. Finally, in 1869, the Minnesota Sioux, goaded by many wrongs, arose and murdered many of the settlers, afterward fleeing into the country of the Unkpapas and appealing to them for help, urging that all Indians should make common cause against the invader. This brought Sitting Bull face to face with a question which was not yet fully matured in his own mind; but having satisfied himself of the justice of their cause, he joined forces with the renegades during the summer of 1863, and from this time on he was an acknowledged leader. Sitting Bull joined in the attack on Fort Phil Kearny and in the subsequent hostilities; but he accepted in good faith the treaty of 1868, and soon after it was signed he visited Washington with Red Cloud and Spotted Tail, on which occasion the three distinguished chiefs attracted much attention and were entertained at dinner by President Grant and other notables. He considered that the life of the white man as he saw it was no life for his people, but hoped by close adherence to the terms of this treaty to preserve the Big Horn and Black Hills country for a permanent hunting ground. When gold was discovered and the irrepressible gold seekers made their historic dash across the plains into this forbidden paradise, then his faith in the white man’s honor was gone forever, and he took his final and most persistent stand in defense of his nation and home. His bitter and at the same time well-grounded and philosophical dislike of the conquering race is well expressed in a speech made before the purely Indian council before referred to, upon the Powder River. I will give it in brief as it has been several times repeated to me by men who were present. “Behold, my friends, the spring is come; the earth has gladly received the embraces of the sun, and we shall soon see the results of their love! Every seed is awakened, and all animal life. It is through this mysterious power that we too have our being, and we therefore yield to our neighbors, even to our animal neighbors, the same right as ourselves to inhabit this vast land. “Yet hear me, friends! we have now to deal with another people, small and feeble when our forefathers first met with them, but now great and overbearing. Strangely enough, they have a mind to till the soil, and the love of possessions is a disease in them. These people have made many rules that the rich may break, but the poor may not! They have a religion in which the poor worship, but the rich will not! They even take tithes of the poor and weak to support the rich and those who rule. 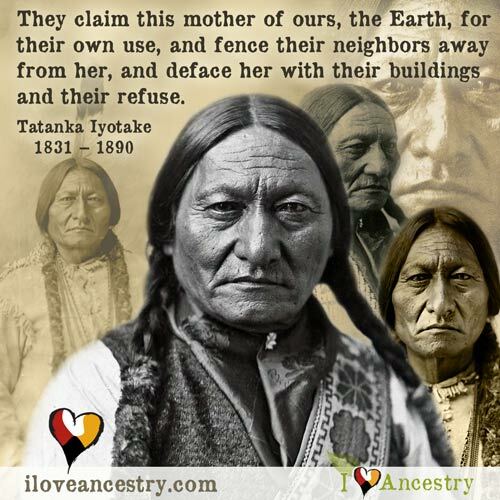 They claim this mother of ours, the Earth, for their own use, and fence their neighbors away from her, and deface her with their buildings and their refuse. They compel her to produce out of season, and when sterile she is made to take medicine in order to produce again. All this is sacrilege. As Sitting Bull spoke, so he felt, and he had the courage to stand by his words. Crazy Horse led his forces in the field; as for him, he applied his energies to state affairs, and by his strong and aggressive personality contributed much to holding the hostiles together. It may be said without fear of contradiction that Sitting Bull never killed any women or children. He was a fair fighter, and while not prominent in battle after his young manhood, he was the brains of the Sioux resistance. He has been called a “medicine man” and a “dreamer.” Strictly speaking, he was neither of these, and the white historians are prone to confuse the two. A medicine man is a doctor or healer; a dreamer is an active war prophet who leads his war party according to his dream or prophecy. What is called by whites “making medicine” in war time is again a wrong conception. Every warrior carries a bag of sacred or lucky charms, supposed to protect the wearer alone, but it has nothing to do with the success or safety of the party as a whole. No one can make any “medicine” to affect the result of a battle, although it has been said that Sitting Bull did this at the battle of the Little Big Horn. When Custer and Reno attacked the camp at both ends, the chief was caught napping. The village was in danger of surprise, and the women and children must be placed in safety. 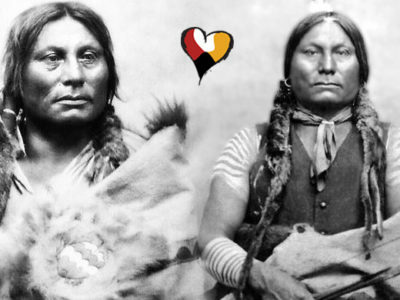 Like other men of his age, Sitting Bull got his family together for flight, and then joined the warriors on the Reno side of the attack. Thus he was not in the famous charge against Custer; nevertheless, his voice was heard exhorting the warriors throughout that day. During the autumn of 1876, after the fall of Custer, Sitting Bull was hunted all through the Yellowstone region by the military. The following characteristic letter, doubtless written at his dictation by a half-breed interpreter, was sent to Colonel Otis immediately after a daring attack upon his wagon train. 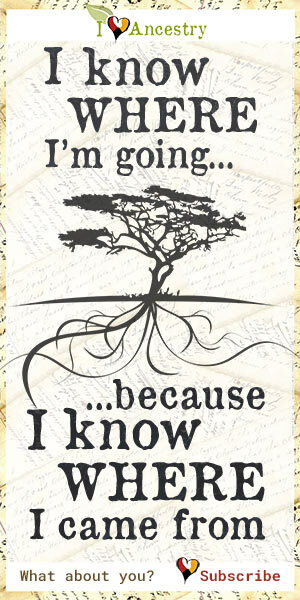 “I want to know what you are doing, traveling on this road. You scare all the buffalo away. I want to hunt in this place. I want you to turn back from here. If you don’t, I will fight you again. I want you to leave what you have got here and turn back from here. Otis, however, kept on and joined Colonel Miles, who followed Sitting Bull with about four hundred soldiers. He overtook him at last on Cedar Creek, near the Yellowstone, and the two met midway between the lines for a parley. The army report says: “Sitting Bull wanted peace in his own way.” The truth was that he wanted nothing more than had been guaranteed to them by the treaty of 1868 – the exclusive possession of their last hunting ground. This the government was not now prepared to grant, as it had been decided to place all the Indians under military control upon the various reservations. 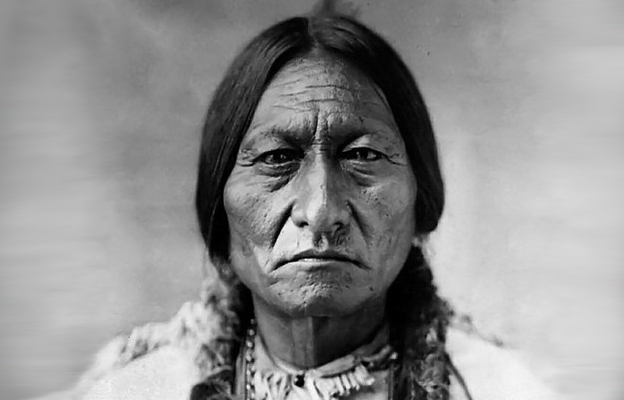 Sitting Bull was not moved by fair words; but when he found that if they had liberty on that side, they had little else, that the Canadian government would give them protection but no food; that the buffalo had been all but exterminated and his starving people were already beginning to desert him, he was compelled at last, in 1881, to report at Fort Buford, North Dakota, with his band of hungry, homeless, and discouraged refugees. It was, after all, to hunger and not to the strong arm of the military that he surrendered in the end. In spite of the invitation that had been extended to him in the name of the “Great Father” at Washington, he was immediately thrown into a military prison, and afterward handed over to Colonel Cody (“Buffalo Bill”) as an advertisement for his “Wild West Show.” After traveling about for several years with the famous showman, thus increasing his knowledge of the weaknesses as well as the strength of the white man, the deposed and humiliated chief settled down quietly with his people upon the Standing Rock agency in North Dakota, where his immediate band occupied the Grand River district and set to raising cattle and horses. They made good progress; much better, in fact, than that of the “coffee-coolers” or “loafer” Indians, received the missionaries kindly and were soon a church-going people. 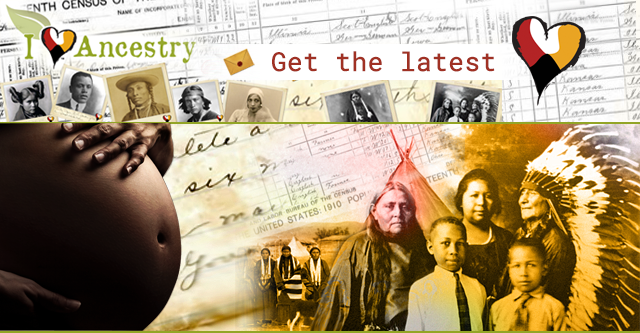 When the Commissions of 1888 and 1889 came to treat with the Sioux for a further cession of land and a reduction of their reservations, nearly all were opposed to consent on any terms. 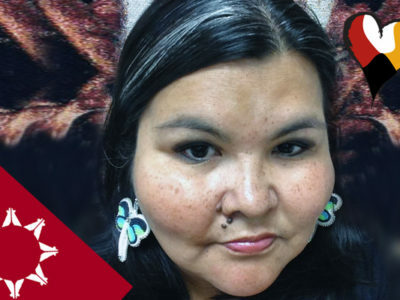 Nevertheless, by hook or by crook, enough signatures were finally obtained to carry the measure through, although it is said that many were those of women and the so-called “squaw-men”, who had no rights in the land. At the same time, rations were cut down, and there was general hardship and dissatisfaction. Crazy Horse was long since dead; Spotted Tail had fallen at the hands of one of his own tribe; Red Cloud had become a feeble old man, and the disaffected among the Sioux began once more to look to Sitting Bull for leadership. At this crisis a strange thing happened. A half-breed Indian in Nevada promulgated the news that the Messiah had appeared to him upon a peak in the Rockies, dressed in rabbit skins, and bringing a message to the red race. The message was to the effect that since his first coming had been in vain, since the white people had doubted and reviled him, had nailed him to the cross, and trampled upon his doctrines, he had come again in pity to save the Indian. He declared that he would cause the earth to shake and to overthrow the cities of the whites and destroy them, that the buffalo would return, and the land belong to the red race forever! These events were to come to pass within two years; and meanwhile they were to prepare for his coming by the ceremonies and dances which he commanded. This curious story spread like wildfire and met with eager acceptance among the suffering and discontented people. The teachings of Christian missionaries had prepared them to believe in a Messiah, and the prescribed ceremonial was much more in accord with their traditions than the conventional worship of the churches. Chiefs of many tribes sent delegations to the Indian prophet; Short Bull, Kicking Bear, and others went from among the Sioux, and on their return all inaugurated the dances at once. There was an attempt at first to keep the matter secret, but it soon became generally known and seriously disconcerted the Indian agents and others, who were quick to suspect a hostile conspiracy under all this religious enthusiasm. As a matter of fact, there was no thought of an uprising; the dancing was innocent enough, and pathetic enough their despairing hope in a pitiful Saviour who should overwhelm their oppressors and bring back their golden age. Men poured out of the neighboring houses, and in a few minutes the police were themselves surrounded with an excited and rapidly increasing throng. They harangued the crowd in vain; Sitting Bull’s blood was up, and he again appealed to his men. His adopted brother, the Assiniboine captive whose life he had saved so many years before, was the first to fire. His shot killed Lieutenant Bull Head, who held Sitting Bull by the arm. Then there was a short but sharp conflict, in which Sitting Bull and six of his defenders and six of the Indian police were slain, with many more wounded. 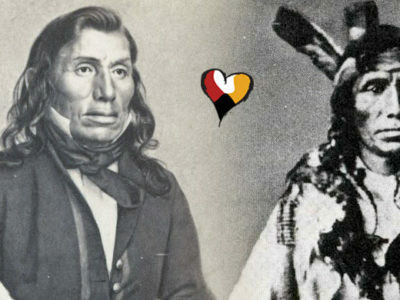 The chief’s young son, Crow Foot, and his devoted “brother” died with him. When all was over, and the terrified people had fled precipitately across the river, the soldiers appeared upon the brow of the long hill and fired their Hotchkiss guns into the deserted camp. Thus ended the life of a natural strategist of no mean courage and ability. The great chief was buried without honors outside the cemetery at the post, and for some years the grave was marked by a mere board at its head. Recently some women have built a cairn of rocks there in token of respect and remembrance.